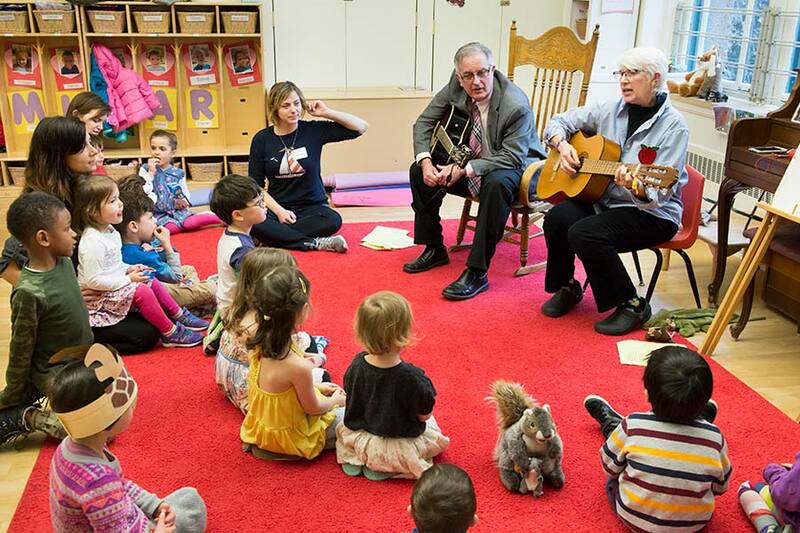 Legacy families — those who have enrolled more than one generation — are common at Carnegie Mellon's Children's School, a laboratory school for children between the ages of 3 and 5. "When I returned with my son, the colors of the rooms and the smell of the space were the same as when I was a child. Then I saw Jean Bird and knew she had been my teacher, and she remembered me," Ayça Akin said. A Children's School alumna, Akin had been a designer and creative director living in New York City five years ago. She applied for her son to attend the Children's School soon after deciding to move back to Pittsburgh. Her second child will start this fall. Paul Fireman, president of Fireman Creative, was a member of the first class when the school was established in 1968. He enrolled his two daughters in 2000 and 2004. They are now attending Brown University and Case Western Reserve University. Due to a number of requests from faculty and staff, Environmental Health & Safety is offering two additional sessions for the combined Floor Marshal and Active Shooter training. You do not have to be a floor marshal or facility coordinator to attend these sessions. This training is appropriate for all faculty and staff. The first hour is dedicated to fire safety topics and appropriate actions during an emergency, while the second hour specifically addresses an active shooter scenario. The sessions are at 10 a.m. on Thursdays, Aug. 9, Sept. 13 and Oct. 11. Seating is limited for each session, so registration is required. Register online. The recent PEARC18 conference brought more than 600 experts and students to Pittsburgh to discuss the state-of-the-art in advanced research computing and data analytics. Led by the Pittsburgh Supercomputing Center, the event inlcuded five days of tutorials, plenary and contributed talks, workshops, panels, poster sessions and a visualization showcase. The annual Practice and Experience in Advanced Research Computing Conference — with the theme Seamless Creativity this year — stresses key objectives for those who manage, develop and use advanced research computing throughout the U.S. and the world. “We are happy that our efforts resulted in a very strong technical program,” said the PSC's Sergiu Sanielevici, general chair of PEARC18. Invited speakers included experts from the National Science Foundation, the National Institute of Mental Health, Intel and several universities, such as the University of Illinois, the Illiinois Institute of Technology, the University of Notre Dame and the University of Colorado. A town hall was held to discuss the NSF's Office of Advanced Cyberinfrastructure. CMU's Wilton E. Scott Institute for Energy Innovation recently partnered with the U.S. Department of Energy’s National Energy Technology Laboratory for a workshop that looked beneath the Earth’s surface. The workshop, “Real-Time Decision-Making for the Subsurface” held July 17-18, aimed to identify the technology and data needs and capabilities required to rapidly analyze subsurface data to aid in developing real-time decision-making tools. Plenary sessions and interactive breakout groups tackled a variety of timely topics, such as improving resource recovery, developing autonomous monitoring systems and managing induced seismicity. Machine learning and data analytics played a large role in the event’s discussions and will be important in the advancements to come. Carnegie Mellon and NETL will release a public report later this year detailing identified research gaps, challenges and recommendations. Joseph Hezir, the former chief financial officer for the U.S. Department of Energy and current Professor of the Practice at Carnegie Mellon's Wilton E. Scott Institute for Energy Innovation, recently shared his team's latest research at the 2018 Congressional Clean Energy Expo and Policy Forum in Washington, D.C. The event on Capitol Hill, hosted by the Environmental and Energy Study Institute and the Sustainable Energy Coalition, brought together businesses, academia and government agencies to discuss and showcase renewable energy efficiency policy and technology, and called for more federal support for the renewable energy industry. During his talk, "Manufacturing & Energy Efficiency Policy Innovations to Advance Industry 4.0," Hezir said experts will need to approach the challenges of energy efficiency and manufacturing from "a systems-level perspective and look at energy efficiency not in isolation, but as an overall component of the manufacturing process." Children's School teacher Jean Bird leads a music session while, at left, Children's School alumna Ayça Akin particates with her two children.